Harley-Davidson Motorcycles and Marvel have teamed up to develop a new series of superhero and supervillain-inspired bikes. Dealerships across Australia and New Zealand have taken part in the collaboration, creating custom bikes to commemorate Marvel characters, including Groot, Ghost Rider, Black Panther, Black Widow and Thor. 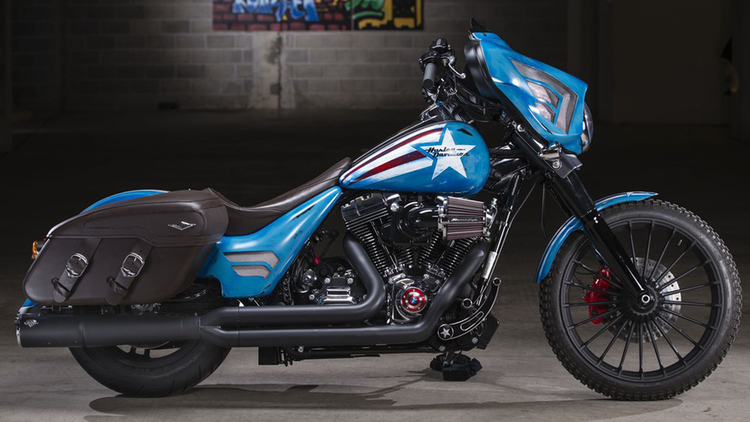 The partnership also coincides with the 75th anniversary of Captain America, and will see the launch of a Street Glide special bike that boasts the superhero’s iconic blue and red colour markings. “We customised the Captain America Street Glide Special to inspire Harley-Davidson dealers across Australia and New Zealand to create their own Marvel character inspired custom motorcycle using the wider H-D range. The results have been phenomenal. A true combination of super powers, with over 16 Marvel characters represented,” Turney says. The line features a formidable lineup of heroes, including Groot, Black Widow, Black Panther, Spider-Man, Iron Man, Thor, Hulk, Spider-Gwen, Wasp, Ultron, Drax, Ant-Man, The Punisher, Ghost Rider, and Thanos.